Algiers Metro was inaugurated on 31 October 2011 after nearly three decades of development. 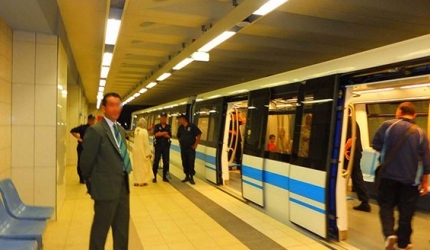 It is Algeria’s first metro system and the second metro transport system in Africa. The metro serves three million inhabitants of the city of Algiers, carrying 300,000 passengers every day. The underground transit system currently has one 9.2km line with ten stations, which was built with an investment of £750m. 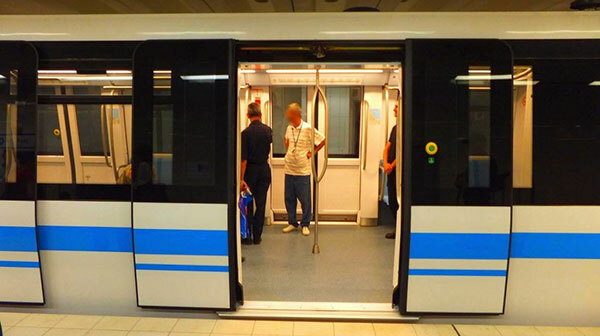 RATP El Djazaïr, a subsidiary of Régie Autonome des Transports Parisiens (RATP), was awarded an eight-year contract by Entreprise Métro d´Alger transit authority (EMA) to operate the line. A 4km extension for Line 1, from Haï El Badr to El Harrach-Centre, was launched in October 2012. Construction is scheduled for completion within 23 months and was expected to be opened in November 2014. Proposals for the construction of two more lines are also being considered in the near future. The rapid transit system was originally proposed in the 1970s as a 64km network. It was officially launched in 1982 with feasibility studies completed in 1985. A German firm and a Japanese specialist were employed for construction of the network. The project, however, stalled due to a lack of funding following the fall of oil prices, one of Algeria’s main resources. Construction restarted in 1988 but discontinued again due to financial and political problems. During this period, only four stations were constructed. The underground transit system currently has one 9.2km line with ten stations, which was built with an investment of £750m. Proposals for relaunching the project by inviting tenders from international participants were discussed in 1999. Two new contractors, Systra-Sgte, a French firm, and Agéro-German GAAMA were chosen for project management and construction, respectively. By 2003, Algeria’s economy stabilised and the metro project secured the necessary funding for construction. In January 2006, EMA awarded a turnkey contract worth €380m for construction of the metro to a consortium formed by Siemens, Vinci Constructions and Construcciones y Auxiliar de Ferrocarriles (CAF). The consortium was responsible for civil works, supply of electrical and mechanical systems, and fitting out. Around 100 tests were conducted on the metro line in September 2011, with the line carrying out its debut passenger operation on 1 November 2011. Line 1 starts from Haï el Badr, located in the southeast of Tafourah Grande Poste. The line runs north and curves to the west, running parallel to Algeria’s coastline. 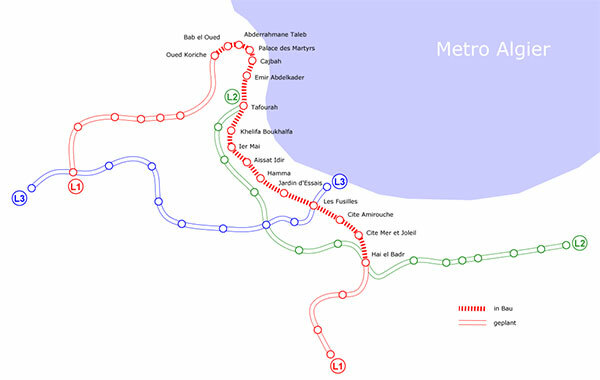 The line’s ten stations serve the regions of Bachdjarah, El Magharia, Hussein Dey, El Hamma, Sidi M’Hamed and Alger Centre. At an intermediate stop, Hussein Dey, the line connects with the EMA’s 23km Bab Ezzouar – Bordj El Kiffan – Derana tram route. CAF supplies 14 six-car train sets for the metro, each with a capacity to accommodate 1,290 passengers. The first train was delivered in November 2008, with the remaining deliveries completed by November 2011. The metro system is equipped with Siemens’ Trainguard MT Communications-Based Train Control (CBTC). The new automatic train control System works by means of bi-directional continuous communication between the on-board and wayside equipment. Construction is scheduled for completion within 23 months and is expected to be opened in November 2014. Siemens also supplied Digiloc train location systems and Airlink radio communication system, and was responsible for track installation, power supply system installation, installation of fare collection equipment and operations control centre. Vinci Constructions was responsible for civil works of the project, which included construction of ten stations, the Bachdjarah depot, the control centre and maintenance depot. Tunnel ventilation and installation of escalators was also carried out by Vinci. Thales was subcontracted by Siemens to supply ticketing systems for the metro, while a consortium of Colas Rail, a subsidiary of Bouygues, and KOU GC have been awarded a €85m contract for Line 1 extension.